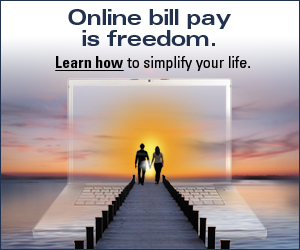 Online Bill Pay saves you time and money! Now, paying your bills has never been easier or more convenient. Save money by no longer purchasing paper checks, envelopes or stamps. Save time because Online bill payment allows you to setup recurring monthly transactions even if the amount you pay changes. Set up automatic bill payees so that your bills are sent to your BillPay for extra convenience. Make person to person payments easily to reimburse a friend for lunch, share in on the expense of a gift for a family member or to pay someone for an item you are purchasing from them! For a small fee, purchase a gift card for family member or make a charitable contribution. IMPORTANT: You must have Online Banking in order to setup the online bill pay feature. For more details, refer to our Billpay User’s Guide.